LG Optimus L1 II Tri is a new model smartphone with compact body, appealing design and affordable price. At first glance the phone seems as a nice budget device that fits easily in the hand and provides you with the basic capabilities of a mobile device that you would need in your day. However the Optimus L1 II Tri has more special possibilities than you can guess by judging only by its appearance. The small-sized attractive handset supports triple-SIM, a very rare capability in the mobile world today. LG boasts a dedicated key for switching between the SIM cards. 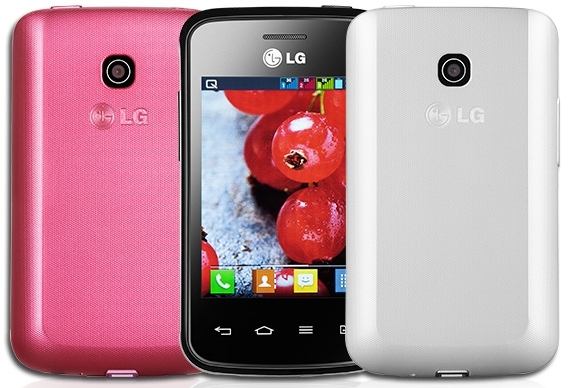 The new model smartphone reminds a lot to one of the last year’s handsets by the company – the LG Optimus L1 II E410. The Optimus L1 II Tri is an entry-level smartphone. It sports a 3-inch screen that boasts 240 x 320p resolution. This handset is among the smallest modern devices released today – size-wise. It has 512MB RAM on board and 4GB storage. The microSD slot provides the possibilities for expansion of the memory. Optimus L1 II Tri boasts a 2MP camera on the back. It is powered by a 1540mAh battery. The platform that is running the device is Android 4.1 Jelly Bean. The new phone is purposed for Latin America. It is already released by different retailers in Brazil. It can be purchased from the official website of LG in Brazil as well. The new device arrives in three different colors – pink, white and black. It costs $127 unlocked. The extraordinary capability to work with three SIM cards is something very rare for the digit world. We are yet to find out how users will appreciate the features of the low-end smartphone. For now there is no information whether the Optimus L1 II Tri will be launched outside Brazil.